Typha latifolia and Typha angustifolia can be used as tools for understanding hybrid vigor, invasiveness and the potential for biomass ethanol production. T. latifolia and T. angustifolia are rapidly expanding across North America most likely in response to the increased disturbance of wetlands. T. angustifolia is sympatric with T. latifolia across most of the northern part of its range and is considered an invasive species in North America. The ultimate goal was to prepare samples of both cattail species for sequencing in order to compare the gene expression at the genomic-wide level. The preparation of samples to be sequenced had multiple steps which needed positive verification before proceeding to the next, thus the amplification of control genes are a vital component to the procedure. We did a literature search and found phytochelatin synthase and metallothionein-like protein gene sequences that have been discovered in T. latifolia and designed primer pairs for the project. To begin this process we planted seedlings of both species in a highly controlled environment and extracted RNA to be used for cDNA synthesis. We successfully isolated both genes from cDNA of T. latifolia and T. angustifolia. The verified cDNA samples could then be utilized for mass sequencing. Hack, Dustin and Jordan Gurter. "Isolation of Phytochelatin Synthase and Metallothionein-Like Protein cDNA from the Cattails Typha latifolia and Typha angustifolia." 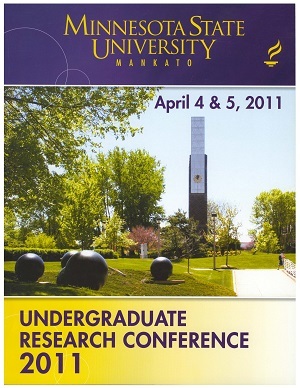 Undergraduate Research Symposium, Mankato, MN, April 4, 2011.